As Rooftop Solar Challenges Utilities, One Aims For A Compromise As more homeowners install solar they're using less energy from their utilities, which in turn hurts their business. One utility in Colorado has forged a deal that may be a model for other states. K.K. 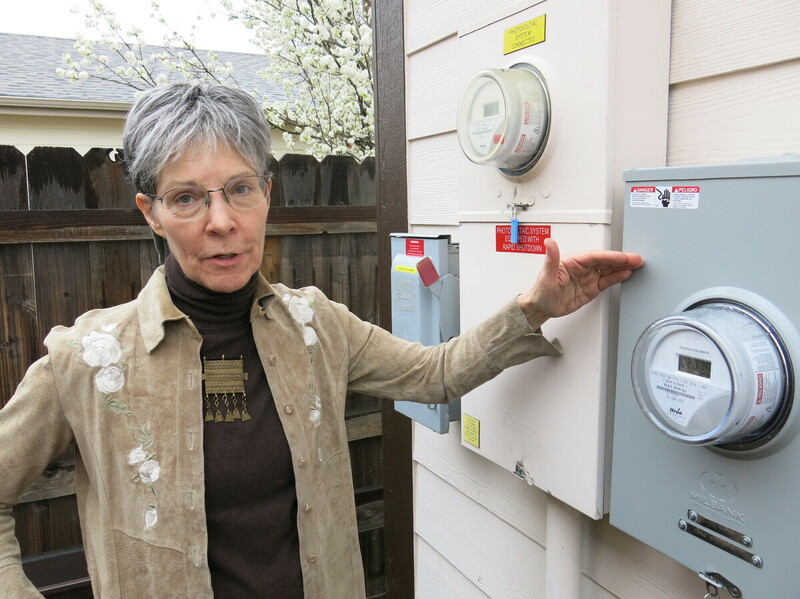 DuVivier stands by a smart meter that sends electricity back to her utility, Xcel Energy. The Denver home gets credits from Xcel for power that's added back to the grid. If you've ever wondered what an extreme home makeover looks like for an environmentalist, take a visit to Lance Wright's garage in south Denver. He walks past his electric car to batteries near the back wall. "All of this is the devices necessary to control our solar panels," Wright says. There are solar panels on the roof above. He and his partner designed the system to maximize energy efficiency. K.K. DuVivier says that means the power moving through the meter is sometimes negative. "I have a picture of Lance with it going back to zero, because we generated more than we used," she says. They get credits from their utility, Xcel Energy, for power they add back to the grid. And they're not alone. "Some people have the opportunity to brag about how smart their kids are or how fast their car goes," Wright says. "Our friends brag about how efficient their house is." But that efficiency comes at a cost for utilities: The more energy customers generate for themselves, the lower their utility bill. That leaves less money to maintain the electric grid, utilities say. This dynamic has created tension in states like Nevada. In 2015, Nevada utility regulators cut back on credits offered to solar customers. It prompted many solar companies to leave the state. But the backlash was so strong that parts of the decision have been reversed. In Colorado last year, things were also looking tense. As more customers added solar, Xcel faced mounting losses. They wanted to charge a new monthly fee, and that idea rattled the solar industry. So Xcel negotiated with two dozen parties, including consumer advocates and environmental groups. "We're not against solar options," says Alice Jackson, with Xcel. "We're not against our customers having different choices. What we have to make sure and what is what we feel is our responsibility is to make sure that that when those personal choices are made, they don't cost their neighbors money." As part of a sweeping agreement, Xcel will try to find a way to cover grid maintenance costs even if electricity use goes down. Xcel also dropped the idea of a monthly fee. But the company will experiment with charging different rates, which means DuVivier and Wright will pay more for electricity during peak times. They consider it a challenge. "We're aiming for net zero carbon with our home," Wright says. "And we're going to be close." Savvy customers can save money. And that actually may help Xcel if it doesn't have to ramp up extra power sources during the hottest days of the year. The agreement, which could be a model for other states, also calls for a big expansion of community solar farms. Outside Boulder, Tom Hunt, with Clean Energy Collective, unlocks the fence to a large array of panels his company built. He says the option is attractive to customers who live in apartments or homes where solar won't work. "Most of the projects being built now are about double this size — two megawatts," he says. "So you'll get another 55 or so of these over the next three years." Xcel and solar advocates like Hunt will continue to meet and discuss future challenges like the next big shift: when more rooftop solar customers install batteries to store energy. The hope is to diffuse future battles before they happen. Grace Hood is an energy and environment reporter with NPR member Colorado Public Radio. You can follow her @gracehood.